Motivation. It seems to be the missing ingredient for getting going with a lifetime exercise program. I’m always amazed at the motivation people have when they’re first diagnosed with bone loss. 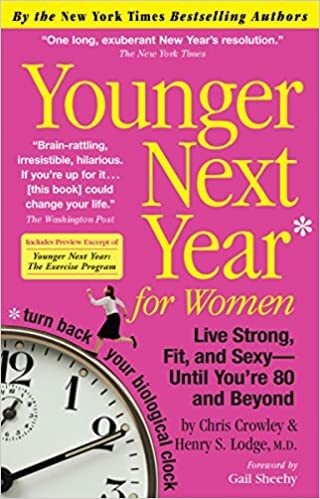 To keep that initial boost of energy high, I often recommend reading Younger Next Year for Women by Chris Crowley and the late Henry M. Lodge, MD. Motivation! It gets the exercise job done. If you haven’t read this gem of a book, then you’re in store for a real treat. I refer to it as “Required Reading” for my strength training class participants. It’s funny, compelling and super-inspiring. Crowley and Lodge are an attorney and physician, respectively, and do a fabulous job of telling us just what we need to hear to stay on the fitness bandwagon. 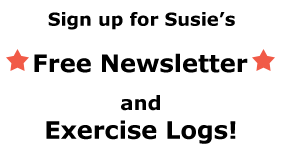 “Life is an endurance event: train for it!” is their motto, and after reading their book, you’ll be on board. They combine knowledge of the science of fitness (Lodge) with experience transitioning from unfit to fit (Crowley) in a wonderfully readable and enjoyable book. Don’t miss this one. 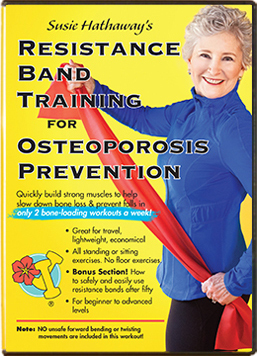 Honestly, I haven’t seen a more motivating book than this one for getting people going with a lifetime exercise routine. It will inspire you to keep moving, no matter what! 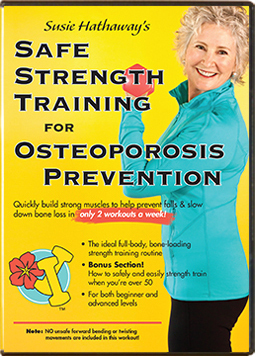 Motivation–it’s the key to fitness and stronger bones. PS-I’m a fan of Audible books because I can get my “reading” time in while walking, doing dishes, and even cycling. But if you have the time to read a hard copy of Younger Next Year for Women, it’s much better than the Audible version. It’s a very funny book and the Audible narration doesn’t do it justice to boost your motivation. You can get a hardback or paper copy for pennies, so go retro with this one! A good plan, Sue, and one that I’m sure you’ll achieve! How do you feel about Tai Chi workouts? I am currently sorting my large collection of exercise videos. I love Tai Chi and would hate to have to give it up. The balance, strength, and focus gained from doing Tai Chi are all very helpful for avoiding falls and fractures. But, if it includes rounding the back and twisting, it puts you in a risky position for vertebral fractures. Any exercise program can be adapted so that you can keep a neutral spine and not round the back or twist to the point of strain. If you let your instructor know what adaptations you need, he or she should be able to help you modify your movements. Better yet, if you can find a class for those over fifty, it might already be adapted with no bending at the waist or extreme twists. Sometimes, medical centers offer exercise classes that are adapted for those with chronic physical conditions. Your physical therapist may be able to refer you to the appropriate class. The book “Younger Next Year for Women” provided great info and perspective on aging and staying physically fit — thank you for recommending it! If I understand correctly, the so called Fitbit devices will not suffice for a hearth monitor. Do you have any recommendations for a basic heart monitor? Lana, I have a Polar brand heart rate monitor, with the strap, and it works well! I never found the wrist heart rate monitors to be very accurate, but maybe they’ve improved in the past few years. I am having difficulty finding personal trainers or classes in the Los Angeles, Pasadena area. I was wondering if you or anyone could help? One of the leading fitness associations, IDEA Health & Fitness Association has a “Find a Personal Trainer” link on their website. You can enter your city and review those listed. I see 4953 are currently listed. You can also search for Gyms/Studios. Best wishes!